One complete loop takes 90 minutes and covers 9 miles of Savannah’s Historic District, Colonial District, and Victorian District; however, our on and off feature allows you to take the tour at your leisure. You can actually fit the tour to your schedule and make it last as long as you want. (One day use only). How many stops do you have along the route? We have 15 designated stops along our tour. These are located conveniently near historical points of interest, museums, parks, restaurants, and shopping areas. Yes, the drivers tell you about the rich history of Savannah, from the founding of the colony, the Civil War history, to the many movies and TV shows that have been filmed here. The conductors regale you with amusing anecdotes about the colorful individuals who helped shape Savannah’s history. Is it better to ride the tour all the way around one time, and then start again at the beginning to get on and off? It is more advantageous to start getting on and off the trolley the first time you go around. There is so much to see and do in Savannah that you may find that there are more stops which you want to get off and explore than you realize. The complete loop is 1 ½ hours, and you lose precious time that could be spent exploring the sights if you ride all the way around without taking advantage of the on and off option. We recommend that you re-board at the same location you got off at last. Since all of our drivers follow the same route and historical script, you essentially pick up the narration where you left off. Does the price of the ticket include admission into any of the museums? No, the ticket price is for the trolleys only; however, you can purchase discounted tickets for museums, historical houses, and other Savannah attractions from any of our sales representatives or online. How often do the trolleys come by each stop? Trolleys run on a 20 minute schedule. This means there will be a new trolley by each stop approximately every 20 minutes – more frequently than any other company. How do I get back to my car from one of the trolley stops? The trolleys follow a continuous loop, so if you board at any of the stops and do not disembark, it will eventually bring you back to where you started. We always have plenty of sales reps at different stops in the historic district. They are always happy to give directions and help the guests find the closest stop for the quickest way back. What are the hours the trolleys run? The historical tours run daily from 9:00am to 5:00 pm from August – March and 9:00 am to 6:00 pm from April to June, with tours starting approximately every 20 minutes. See Trolley Schedule. What is the latest tour that runs? You can still get a complete 1 ½ hour tour starting at 4:30, without any on and off privileges. Yes, we pick up at any hotel or B&B in the Historic District. We also pick up from most hotels in the surrounding area. For more information, go to complimentary shuttle service. I see several different colored trolleys; can I get on any of them? No, there are several different trolley companies in the Savannah area. We operate the bright and colorful orange and green trolleys. What is the difference between your tour and the other tours I see around town? There are many things that set us apart from our competitors. First, we have a very intensive training course that lasts for several weeks, which all of our conductors are required to participate in and complete. 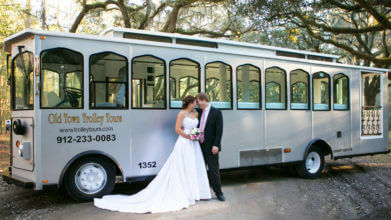 We have the largest fleet of trolleys in Savannah, and can therefore promise less waiting between trolleys. Our tour conductors follow a set route, so you know you will never be stranded at a stop without any trolleys coming through to pick you up. We are so confident that you will not regret your decision to ride with our company that we offer a 100% Satisfaction Guarantee*. If the trolley that I want to get on comes by full, what do I do? Don’t panic. Don’t walk to another stop. The tour conductor will call the dispatcher to see when the next trolley will be through. We are prepared for these scenarios, and if need be, we will send out an “extra” driver to “come to the rescue”. Usually another trolley will be there within 10 minutes. Yes, the on and off ticket is for the whole day. This is great, because it allows you to go back to a stop you have already been to if you want to spend more time exploring. Is the CAT shuttle trolley that I see going around the Historic District a narrated tour? No, the CAT shuttle is the public transportation for the downtown area run by the city transit system. They do not offer narration and are strictly public transportation. Is the trolley open – aired or enclosed? All of the trolleys are open-air for most of the year. The trolley windows can be shut in cold or rainy weather. Do you run on holidays? Yes, we run on every holiday except for St. Patrick’s Day and Martin Luther King, Jr. Day. Large parades are held in Savannah on those days disabling us from running tours. We do run a transportation shuttle on St. Patrick’s Day from the Oglethorpe Mall to the downtown area. What are the ages for children and adults? Children are ages 4 – 12. Adults are 13 years of age and up. How many days is the trolley ticket good for? The ticket is for one day only. However, 2nd day tickets can be bought at less than ½ the price of an on and off ticket at $10 per person. Go to Savannah Tickets. Does the 2-day pass have to be used on consecutive days? Are your trolleys handicap accessible for individuals with wheelchairs and motorized scooters?